In his recent book, The Dimensions of Consequentialism, Martin Peterson puts forward a new version of consequentialism that he dubs ‘multidimensional consequentialism’. The defining thesis of the new theory is that there are irreducible moral aspects that jointly determine the deontic status of an act. In defending his particular version of multidimensional consequentialism, Peterson advocates the thesis—he calls it DEGREE—that if two or more moral aspects clash, the act under consideration is right to some non-extreme degree. This goes against the orthodoxy according to which—Peterson calls this RESOLUTION—each act is always either entirely right or entirely wrong. The argument against RESOLUTION appeals to the existence of so-called deontic leaps: the idea is that endorsing RESOLUTION would not give each relevant moral aspect its due in the final analysis. 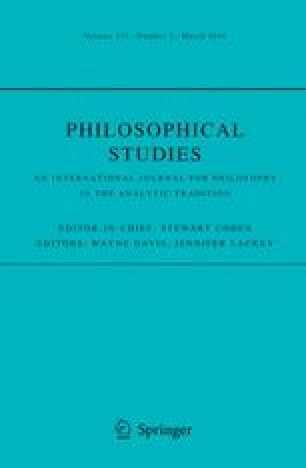 Our paper argues that, contrary to Peterson, (1) all moral aspects remain visible in what can properly be called the final analysis of a moral theory that involves RESOLUTION, (2) moral aspects do not have to remain visible in judgements of all-things-considered rightness or wrongness, respectively, (3) introduction of what Peterson calls verdictive reasons does not change the overall picture in favour of DEGREE. We conclude that multi-dimensional consequentialists should accept RESOLUTION rather than DEGREE. We would like to thank the participants of the workshop “The Dimensions of Consequentialism”, which took place at Konstanz University in November 2013. Special thanks go to Martin Peterson, who provided detailed comments on the entire paper. We are also very grateful for the comments received from Sebastian Köhler, David Sobel, an anonymous reviewer for the journal as well as audiences in Liverpool and Bern (special thanks to Julian Fink for organizing the workshop in Bern). This research was supported by a grant from the German Research Foundation (Grant Number TA 820/1-1). Hsieh, N. (2008). Incommensurable values. In N. Z. Edward (Ed. ), The stanford encyclopedia of philosophy (Fall 2008 Edition). http://plato.stanford.edu/archives/fall2008/entries/value-incommensurable/.